A 1-year-old Japanese girl was referred to our hospital with a heart murmur. The patient had no other symptoms indicating cardiovascular or respiratory problems. A chest radiograph revealed a bulging upper-left heart border without cardiomegaly (figure 1A). Further examinations were performed to determine the cause of the heart bulge. 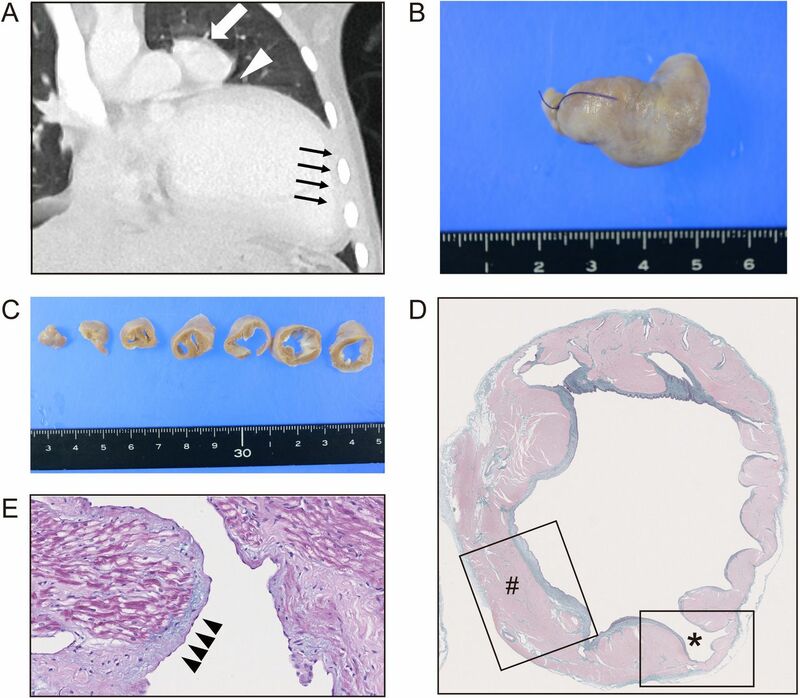 Potential causes included enlargement of the pulmonary artery, a mediastinal tumour, a cardiac tumour, a pericardial cyst and left atrial enlargement due to mitral valve disease or atrial aneurysm. (A) A chest radiograph demonstrating a bulged upper left heart border without cardiomegaly. (B–C) Transthoracic echocardiograms. (B) Parasternal short axis view at the aortic valve level revealing a LAAA without thrombosis. (C) Apical four-chamber view showing the LAAA next to left atrium. LAAA, left atrial appendage aneurysm. ECG examination showed normal sinus rhythm, but an echocardiogram revealed a left atrial appendage aneurysm (LAAA) without thrombosis (figure 1B and C). Chest CT showed a LAAA (figure 2A, indicated by a white arrow), interposition of the left lung (a white arrowhead) between the LAAA and the left ventricle and cardiac levoposition (black arrows). These findings suggested a LAAA with a pericardial defect. The patient was followed for 5 years without any complications, including no supraventricular arrhythmia or thromboembolic events, until the LAAA was surgically resected. On-pump heart surgery was done via partial sternotomy with hypothermic cardiac arrest for 31 min. The intraoperative findings revealed that the LAAA with a partial pericardial defect was located dorsal to the left phrenic nerve. The pathological findings showed that the LAAA was roughly 3 cm long (figure 2B) and 1–2 cm in diameter (figure 2C) and had three layers: epicardium, myocardium and endocardium (figure 2D, indicated by #). Evaluation of the layers revealed partial thinning of the wall (figure 2D, indicated by *) and fibrotic endocardium with alcian-blue-positive, mucinous degeneration (figure 2E, black arrowheads). (A) Chest CT demonstrating LAAA (indicated by a white arrow), interposition of the left upper lung tissue in a region of partial pericardial defect (indicated by an arrowhead) and levoposition of the heart (black arrows). A surgical specimen of LAAA (B) after the fixation and (C) slicing. (D) Masson’s trichrome staining of surgical specimen showing the three layers (#) consisting of epicardium, myocardium and endocardium and a partial thinning of the layers (*). (E) Fibrotic changes of endocardium with alcian-blue positive, mucinous degeneration. LAAA, left atrial appendage aneurysm. A LAAA is a rare congenital or acquired disease that has been reported in fewer than 100 patients, ranging from infants to adults.1 Diagnosis is usually made by chance during routine cardiac screening with echocardiography or chest radiography. However, some patients do show symptoms, including arrhythmia, dyspnoea and thromboembolic events. LAAAs are classified as intrapericardial or extrapericardial. Intrapericardial LAAAs are associated with a developmental vulnerability of the left atrial wall. In contrast, extrapericardial LAAAs are associated with a pericardial defect, which can lead to high-risk issues such as LAAA herniation, coronary artery compression and myocardial crease.2 Surgical resection is the main treatment option for a LAAA based on the reported cases, regardless of whether the patient is symptomatic,1 and pericardial defects are usually diagnosed during the surgery.3 However, in some cases, choosing the optimal timing for the surgery can be difficult if the patient has a small LAAA with no symptoms. In this case, we diagnosed a LAAA with a pericardial defect before surgery and followed the patient for 5 years to lower the risk of intracardiac surgery associated with the patient’s young age. 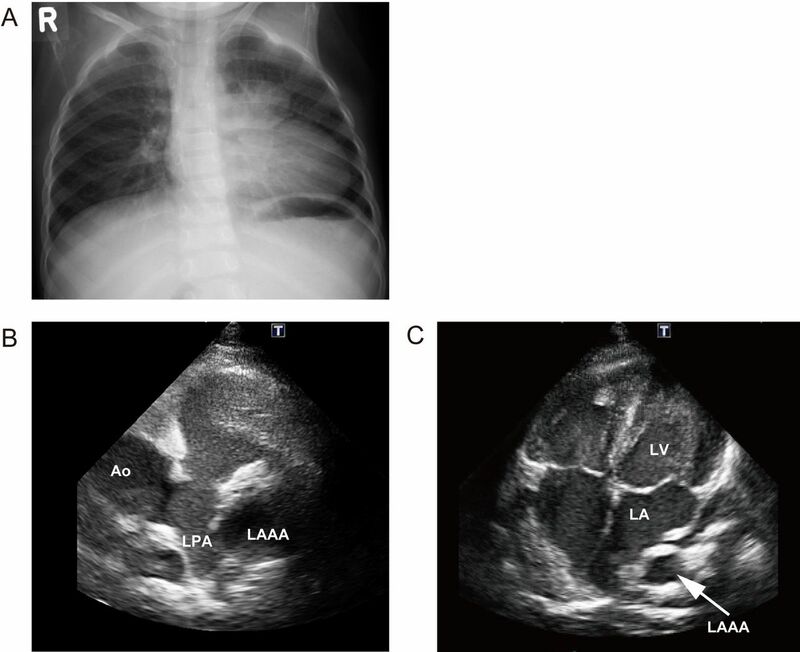 In conclusion, we found a LAAA with a partial pericardial defect in a 1-year-old girl through chest radiography that revealed a mass-like structure at the left-heart border. Preoperative diagnosis of a LAAA with a pericardial defect was important to assess the risks of the condition. A left atrial appendage aneurysm (LAAA) is a rare condition that must be considered in the differential diagnosis of any case of a bulging upper-left heart border. LAAAs with a pericardial defect can lead to high-risk issues such as LAAA herniation, coronary artery compression and myocardial crease. A pericardial defect could be diagnosed preoperatively by CT to estimate the risk of the complications. The authors are grateful to Dr. Yusuke Ohashi for pathological examinations and analysis, to Dr. Osamu Adachi for interpretation of surgical procedures, to Dr. Hideki Ota for radiological interpretation, and to Dr. Kengo Kawano for discussions. Contributors CO and MK (Kimura) performed conception and design, acquisition of data and drafted the article. MK (Kitami) analysed the radiographic data. SK revised it critically for important intellectual content.